Some 1,000 anti-low pay protesters have delivered a petition with over 1 million signatures to McDonald’s headquarters in Oak Brook, Illinois. 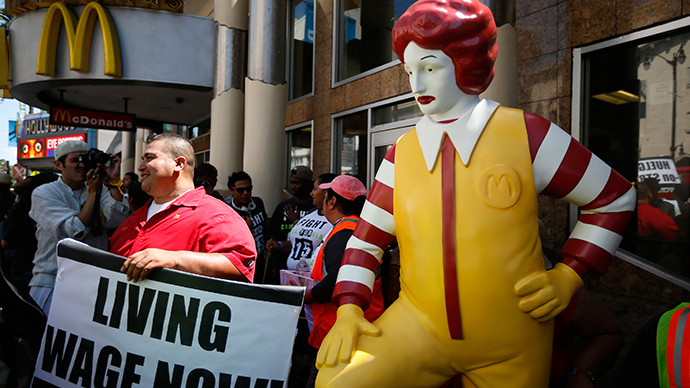 Ten workers from the crowd were permitted into the fast food giant’s compound to hand it over. The “Fight for 15” group, which is demanding the multi-billion dollar empire pay its workers a minimum of $15 per hour, marched toward the McDonalds’s offices Thursday morning. The demonstrators chanted: “We are the workers, the mighty, mighty workers, fighting for justice,” the Chicago Tribune reported, in what was a peaceful march. The protesters were carrying flags and were in a jovial mood, despite inclement weather. But there was a serious, determined mood among marchers. “I think they don’t understand what it is like to make what we make. They should come and work at one of our stores and come and get a check after two weeks and see how much it is and can they live off it,” Corey Anderson, a McDonald’s worker who earns $8.25 an hour after working for the fast food giant for 2 1/2 years, told AP. “I have to give half my check just to pay for somewhere to live and for utilities. I need more to support myself,” he said. Police had cordoned off a road near the McDonald’s HQ, They then told protesters that they were about to enter private property. The march on the McDonald’s HQ coincided with the company’s annual shareholder meeting, which took place at 09:00 local time. Another demonstration on Wednesday saw around 2,000 protesters turn up, who had traveled from as far as Kansas City and New York City. Police were forced to close the campus. McDonald's new CEO Steve Easterbrook announced last month that starting pay at the company-owned restaurants would be set at $1 above local minimum wage, starting July 1, reaching $10 per hour by the end of 2016. Activists have criticized the increase as insufficient, as this would only apply to around 90,000 of some 660,000 workers at McDonald’s fast food restaurants around the country. Many people working in McDonald’s restaurants are employed by franchise holders, rather than McDonald’s directly.